Today fly to Albuquerque, founded in 1706, where you will meet your Tour Director. Later check into your hotel for a two nightstay. Tonight enjoy a Welcome Dinner with your fellow travelers. Today experience one of the most photographed events in the world, the Albuquerque International Balloon Fiesta. Early this morning view over 100 colorful balloons from around the world at Dawn Patrol, followed by the Mass Ascension. The balloons make the sky become a pallet of multicolored orbs dancing in the cool morning light. Later enjoy an Albuquerque City Tour featuring the Indian Pueblo Cultural Center depicting the history and culture of New Mexico’s 19 Native American pueblos. Stop in historic Old Town to stroll the historic adobe buildings that house over 150 shops, galleries and restaurants. Also see the icon of Old Town, the San Felipe de Neri Church. 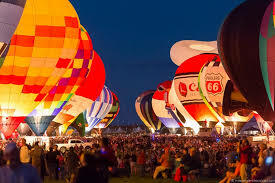 Later witness the Balloon Glow, where just before dusk burners from hundreds of balloons light up the evening sky. This morning travel to Bandelier National Monument, best known for mesas, sheer-walled canyons, rock art and ancestral Pueblo dwellings. Next visit the Los Alamos Bradbury Science Museum to learn about the Manhattan Project and the creation of the world’s first atomic bomb. Later today arrive in Santa Fe for a three night stay. 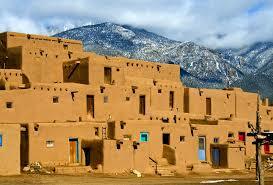 Depart this morning and travel north via the “High Road to Taos” passing through ancient villages founded in the 1700’s. Stop in the Spanish village of Chimayo to visit El Santuario, revered by pilgrims for the healing power of dirt found inside the chapel. Arrive in Taos, the historic home of the Pueblo Indians. Enjoy a brief Taos City Tour and learn about this fascinating city rich in culture and scenery. Atop a plateau between the Rio Grande and the Sangre de Cristo Mountains, Taos has lured artists and writers since the 19th century. Enjoy lunch on your own and shopping in the Taos Plaza. Later enjoy a tour of the Taos Pueblo, one of the oldest continuously inhabited communities in North America before returning to Santa Fe. Today discover Santa Fe, the upscale resort and artist community with Spanish-Pueblo roots. Enjoy a wonderful Santa Fe City Tour including details about the history, culture and unique architecture of this interesting city. See the Plaza, Loretto Chapel and the Palace of the Governor’s, a Santa Fe landmark built in 1610. Enjoy the rest of the day and evening at your own pace in this historic city to explore the many art galleries, museums, restaurants and shops. Tonight enjoy a Farewell Dinner at a local restaurant in the Santa Fe area. Fly home with wonderful memories of your Albuquerque Balloon Fiesta Tour.